The heart of this event is you, our participants—and we need your help to make the biggest impact possible against breast cancer. Remember, your registration fee helps gets you to the start line, but your fundraising dollars will help us find a cure. Your support will fund breast cancer screening, treatment and education programs that save lives! NEW THIS YEAR! 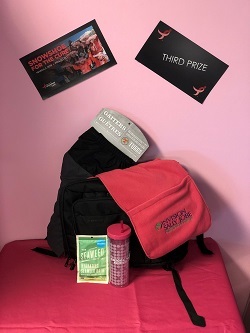 We aren’t closing fundraising until Friday, March 1 (at 11:59 p.m.) so you have more time to fundraise to be eligible to win one of our swag bags we will be giving out during the Closing Ceremony that starts at 10:30 a.m. Plus, the entire month of March is open to accept donations so once the event is over, your fundraising doesn’t have to be! After you register for Snowshoe, you automatically received your own fundraising website, which can be personalized. Your website is your starting point for spreading the word and maximizing your fundraising impact. Set a personal goal today (we suggest $100). A simple way to achieve this goal is to ask 10 people for $10.00. You probably know more people than you think you do! 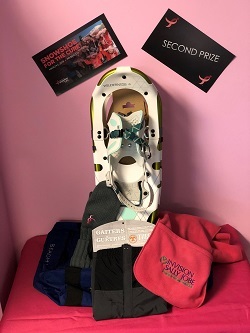 Join us at Snowshoe for the Cure's Closing Ceremony that starts at 10:30 a.m. on Saturday, March 2 as we recognize our top three fundraisers with prizes to show our utmost apprecation for their stellar efforts. Raising money for a cause you believe in can be easy and fun thanks to our new online fundraising tools! When you registered for Snowshoe for the Cure, you automatically received your very own fundraising website, which can be personalized. Your Participant Center is like the headquarters for your personal fundraising page. We encourage you to log in today and customize your page so that everyone who visits can see your passion for the fight against breast cancer. Many will be inspired to join you at the event or make a donation on your behalf! For those who need an extra nudge, you can also craft and send emails to friends and family or connect directly to your network on Facebook. Be sure to check your participant center often for new donations and to send thank you messages to your supporters. 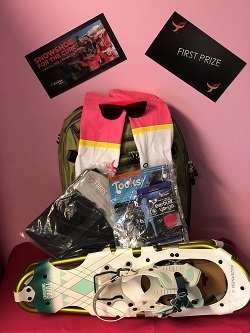 Learn about contests and prizes on event day! Costume Contest: Komen Colorado staff and volunteers will be on the lookout for the attendees who are dressed More than Pink so Snowshoe is the event to don your best attire - from tutus to wigs to sparkly leggings - you'll know if you're a top costumer when you get 'wrapped' by a Komen Colorado staff or volunteer. Fundraising Recognition: As a small token of our appreciation, we will be announcing and recognizing the top three fundraisers on stage during our closing ceremony.